At MediaNiches.com we begin by listening to your needs. Then, we create a furniture solution that is functional and accommodates your specific size requirements at an affordable factory direct price. Each piece is bench-made from quality hand-selected hardwoods at our local factory to fit your plasma, DLP, LCD or project screen television. All our furniture designs are flexible so you can choose the size, color and design elements that fit your needs. Tailor your furniture to reflect your personal style -- select from over 100 fine finish colors, 8 wood species, dozens of mouldings, hundreds of doors, and many hardware options. 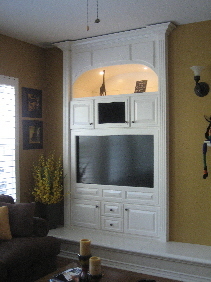 Call us today at 1-866-MY-NICHE or 1-866-696-4242 for your complimentary, in-home measuring and design consultation. Let us show you how to create a space all your own. Depending on your availability, we can begin the process to answer these questions by either scheduling a no-obligation complimentary in-home design consultation. Call us toll-free at 1-866-696-4243. A Design Consultant will set up an appointment to meet with you to discuss your project goals, personal needs and define you style. 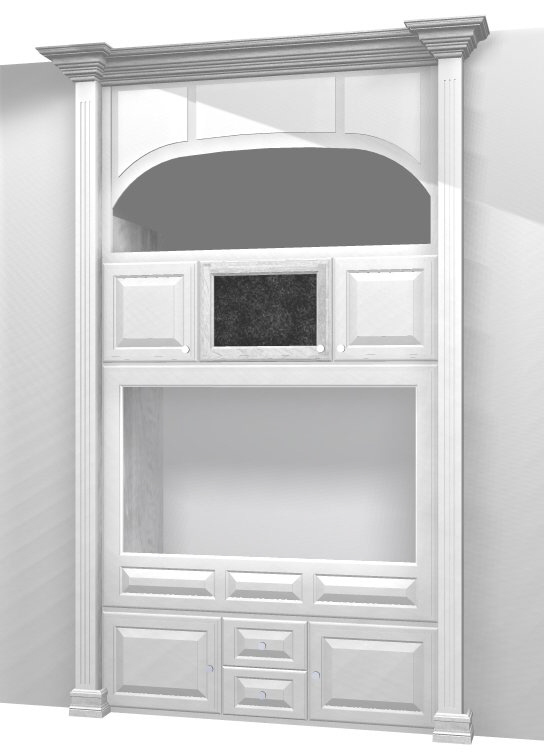 Using the measurements and information from our initial measure or from measurements brought in by you, we will design a preliminary computer generated 3-D virtual design of your new cabinetry. Then the Design Consultant will schedule a time to meet and custom tailor the design with you in “Real Time” to fine tune the design to suit your specific needs and style. All designs are original and are not to be released to other parties or copied unless an applicable design fee of $100.00 has been paid or the design fee amount will be credited toward the job order. During the initial home visit, a factory representative will measure your niche, kitchen or space(s), take digital pictures of the space(s) and special attributes of your space for the design consultant. This step will ensure the accuracy of the design and prevent any potential issues from delaying the installation and making of your custom cabinetry. Upon the approval of a project, we will do a final measurement of your room or kitchen to confirm all measurements. During the in-home visit, our design consultant will re-measure your space, review accessibility, and review the final design. Once we’ve determined that your new cabinetry will fit your space, it is important that it can be delivered and moved into the space. We will take digital pictures of the space and access points including doorways, hallways, and stairways, measure entrance sizes, and check ceiling heights. We will use this information to help ensure an efficient delivery. A 50 percent deposit is collected at this time. The balance for the cabinetry is paid upon the receipt of the cabinetry. The installation amount is paid upon completion of the installation – all cabinets to be in usable condition and scope of work completed. We will email or fax you a final design of your cabinetry. After we receive your signed approval, we will process the order for materials and provide an approximate delivery time. The manufacturing of the cabinets with installation typically takes 4-8 weeks. Remember, we can only schedule your project and start work when your final deposit is received and measurements are completed.